Add the sophistication of old-world charm to your deck or patio while still enjoying the convenience of a contemporary, premium design. These carefully crafted Edison-style café lights boast the functionality and durability of the standard LED model with a stylish, vintage twist. The impact-resistant bulbs exude a soft, amber glow, creating an instantly warm atmosphere in any location. This specialty lighting recreates an early 20th century look without the complexities of antique hardware, making it ideal for the historical design enthusiast with a modern edge. 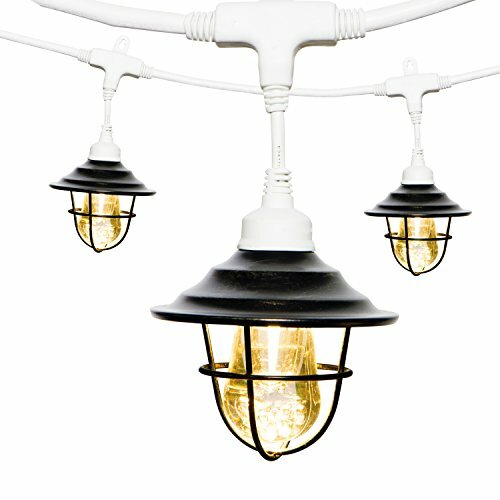 The included oil-rubbed bronze decorative lens shades add a sophisticated spin to these vintage café string lights. The distinctive oil-rubbed bronze finish incorporates seamlessly into your current outdoor or home decor. To attach the shade to your café lights, simply unscrew the lens, position the shade at the base of the light and screw the lens back into place.